At its general meeting held on Thursday, November 23, 2017, the Communities’ Alliance against Displacements (CAD) denounced the spate of mass evictions perpetrated in the name of development. In unison, they are seeking localized solutions to the urban challenges that they face. 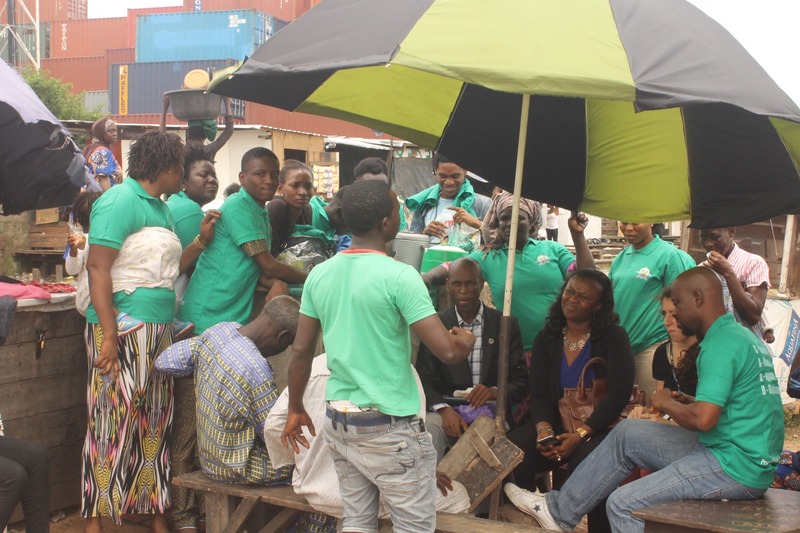 CAD general meeting brings together representatives of informal communities and interest groups in Lagos committed to undertaking individual and collective action against forced displacement. Since it was formed in March 2017, CAD has launched series of campaigns demanding access to basic amenities and improvement in the housing/living conditions in their various member-communities. At this meeting, participants from Ifeoluwa, Badia-East, Otumara, Ifesowapo, Isale-Akoka, Okobaba-east, Ago-Egun, Badia-West, and Mowo Phase II were in attendance. The meeting started with the sharing of ‘progress reports’ from the various member communities. During this time, representatives share information regarding the most-pressing (urban) challenge residents of their communities are facing, and seek ideas from other communities about how to resolve them. Oko-Baba-East residents are experiencing worsening insecurity due to the activities of rival youth gangs and the inability of the Nigeria Police to curtail their activities. The bad state of road networks in the area, and the incessant fire outbreaks in the sawmill, are other pressing concerns. In Otumara, two Baales (traditional rulers) are competing for the traditional stool, causing division and internal strife among local residents. From insecurity and environmental hazards in Okobaba-East, to the leadership tussle between two Baales in Otumara, the experiences shared often draw connections between urban poverty and lack of access to basic services. After the ‘progress reports’ comes the ‘action-planning’ stage on the agenda. At this time, representatives brainstorm on how to nip these challenges in the bud. In response to the situation in Okobaba, CAD members resolved to petition the Bariga Local Council Development Area (LCDA). The petition will suggest strategies for environmental regeneration which can bolster tourism in the fishing communities. In particular, CAD called on the LCDA to rehabilitate the fishing market which is an abandoned Better Life project, an initiative of former First Lady, Maryam Babangida. Okobaba representatives were also encouraged to consider community policing as part of a broader effort to support the Nigeria Police in securing homes and businesses. CAD general meetings usually have two parts: the community interface and the outreach program. During the second part, SPACES FOR CHANGE shared its plans to draft an eviction guideline for Lagos State. The Guidelines will prescribe the procedure for conducting mass evictions when necessary in a way that minimizes human rights violations and the hardship often associated with forced displacement. Again, community representatives decried the role of security agencies during evictions, the length of notices, the lack of resettlement and compensation for evictees, among others. Communities want security operatives to be more humane and to act with a high sense of professionalism. It is typical for state officials to paste contravention notices on buildings, requiring local populations to move in 8 days. Officials often destroy legal and illegal dwellings after the 8-day period without taking into account the historical status of the dwellings and their inhabitants. They argued that it is practically impossible to vacate, or move entire households within 8 days. The economic recession complicates the situation. Accordingly, community representatives recommended that adequate notices (and compensation) must precede eviction exercises done in the public interest. PreviousPrevious post:MEMORANDUM SUBMITTED TO THE HOUSE OF REPRESENTATIVES’ COMMITTEE ON CIVIL SOCIETY ORGANIZATIONS AND DEVELOPMENT PARTNERSNextNext post:What Should an Eviction Guideline Contain?